Robert D. Crumb is a well known American illustrator, known more for his subversive and satirical views of pop-culture in America, taking shots at controversial American topics that most artists in the mainstream would normally not touch. 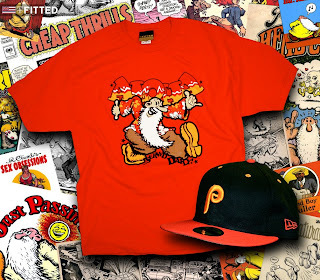 Mr. Crumb is also known for his underground comic book artists, most noticeably the 1970s ‘Keep On Truckin’’ & ‘Fritz The Cat’. He’s even been compared to satirical authors such as Mark Twain and Jonathan Swift. The reason for taking such stances on American pop-culture were due to his losing the legal rights to his aforementioned ‘Keep On Truckin’’ cartoon, dealing with legal battles between him & the IRS. We wanted to pay tribute to Mr. Crumb (who currently lives in South France, but with our own Hawaiian twist as always. 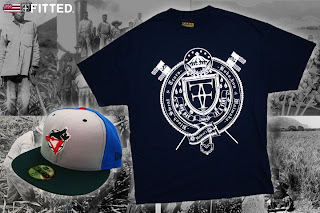 The graphic on this tee portrays what Robert would envision if one his characters were to visit our islands. Printed on red, this tee features one his more prominent characters, throwing up 2 shakas and rocking a Hawaiian shirt, with Aloha Served Daily scribbled in. 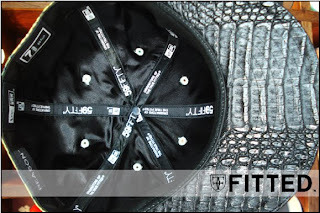 The hat for this drop are a Philadelphia Phillies: all black suede with yellow ‘P’ logo and eyelets and orange brim & button. Please feel free to watch these video’s to get more acquainted with this great American artist. I would like to take this opportunity to thank all of you who came out today (black Friday). Although the line was long (7 hours), We had a lot of great deals that every one was able to take advantage of. 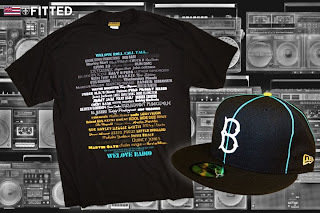 People walked out with 2 hats and a few tees and some walked with 20 hats. Black Friday only happens once a year and for us retail folk, It marks the beginning of the holiday season and the end of a year! From our ohana to yours, we wish you the best during this holiday season. There is nothing like enjoying a nice, tasty shave ice on a hot summer day in the islands, especially from such a prestigious place like Waiola Bakery & Shave Ice, or perhaps even Matsumoto’s Shave Ice on the North Shore . With the many various flavors offered, there’s never a shortage of new & interesting flavors to satisfy your taste buds, along with an exotic color palette to match. From azuki bean, honeydew, li hing mui, watermelon, lilikoi, strawberry & cotton candy just to name a few of the exotic flavors. To pay tribute to Hawaii’s favorite “cool down, icey snack” we put together a Kamehameha pack in an array of different tonal colors, all in LIMITED wool colors (you know we always have to try new & interesting things). These colors range from: blue vanilla, cotton candy, banana, mango, grape and lime. Along with the 6 custom Kams, we put together a shirt, simply called “Ho Brah!” which pays tribute to Vision Skateboards’ “psycho sticks” graphics. Peep the glasses the character is rocking, with the well known Hawaiian triangle / tribal tattoo patterns. Don’t forget, November 28 is also Black Friday, one of the biggest days for holiday sales. 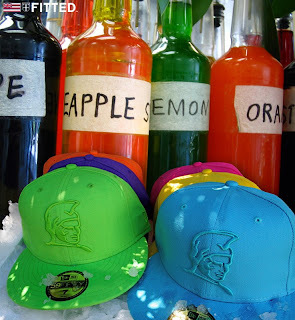 Here are the specific details for all sale related items: For the aforementioned Kamehameha Shave Ice pack, the hats are running for a cool $39.99 and the t-shirt will be $25.00. 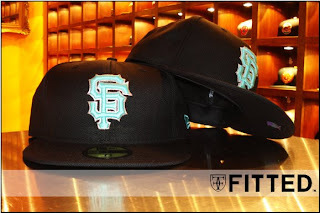 We will also have the sale hats located on the top shelf, which will all be priced at $10. 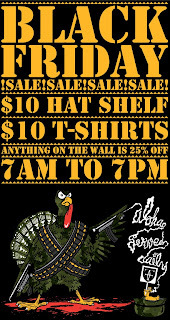 Any other hats located on the wall will be 25% off. 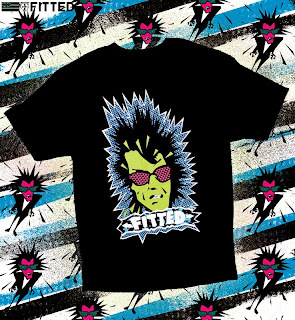 Lastly we have select t-shirts for $10 See you Friday! 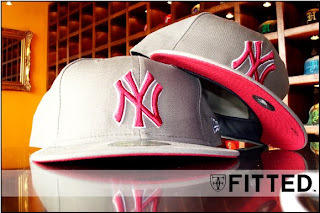 Three new customs in for Tuesday 11.25.08, New York Yankees, Cleveland Indians & NY mets. The Yankees features all over duck moss with a russet red NY logo & top button. 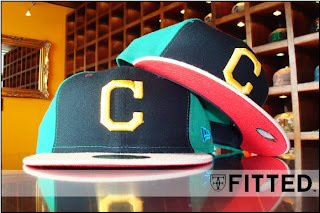 With the Cleveland Indians, we gave it a crazy color scheme: black on the front 2 panels, kelly green on the back four and a beige brim and scarlet red underside. The logo uses California blue and yellow & a purple New Era logo. 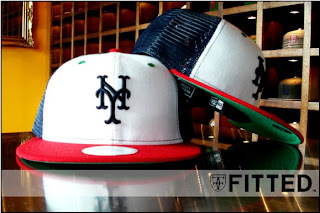 Last but not least, we got a NY mets mesh snapback in red/white/& blue Clean cut & ready to go. Hawaii most definitely is THE cultural melting pot of the world, seeing as there is almost every ethnicity group one could conjure up, all situated across 8 islands that make up the Hawaiian Island chain. Filipinos, Japanese, Korean, Puerto Ricans, Portuguese, amongst many other ethnic groups were brought to these islands to work the plantation fields, tending to the many sugarcane, pineapple and rice fields that popped up across the island in the late 1800s. Fast forward to the present and you’d most likely notice that the Hawaiian population (with Hawaiian blood) has thinned out extremely. According to a recent U.S. Census report, Hawaiians make up only about 16% of the entire population in Hawaii – which is crazy when you really think about it, knowing these islands we live on were once entirely populated by Hawaiians. 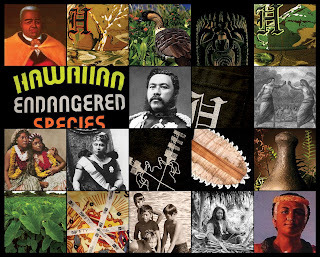 Along with the diminishing of the Hawaiian bloodline, there has also been a steady decline in various plants and animals that thrive on these islands of ours, which include the Hawaiian Monkseal, the Nene Goose and the Hawaiian Green Sea Turtle. Even the ever so elusive silversword plant which makes it’s homes on certain mountain summits is now on the Endangered Species list. And most of this is contributed to the overwhelming overdevelopment across the island as well as the rise in hunting, and generally just plain ignorance. But no need to fret, reservation groups are doing what they can to solve these problems! 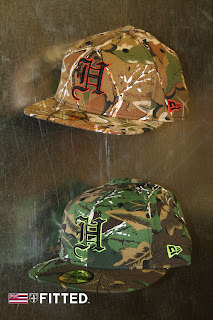 This brings us to our “Hawaiian Endangered Species” pack, consisting of 2 customized “Pride / H” hats and a new shirt. 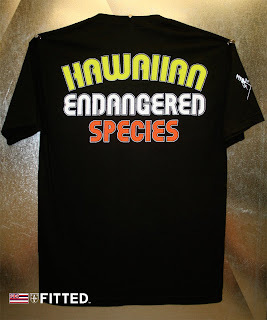 The shirt, printed on all black features a front pocket on the left chest area with the highly recognizable “Pride H” reflective print in Old English, while the back sees the words “Hawaiian Endangered Species” in neon yellow, white and orange. To go along with the shirt is a new “Pride” hat called ” ‘alo’alo” (; to dodge rapidly or continuously; to look about slyly; evasive.) 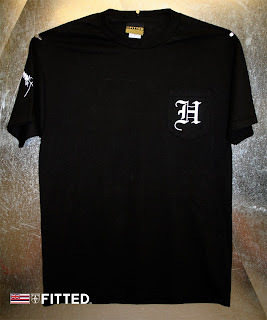 in 2 colorways. The first features a brown “camouflage-ish” print that would seamlessly blend in with any of the many forests across the island. 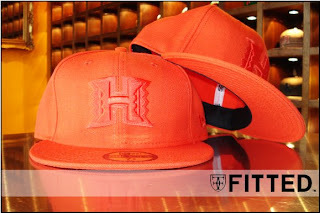 The “H” uses Black with an neon orange stroke, along with both the FITTED crown and crest. The inside has the old Hawaiian state seal printed on a satin lining. The second colorway features a similar pattern seen on the brown, except in a dark green color with subtle hits of brown and tan. 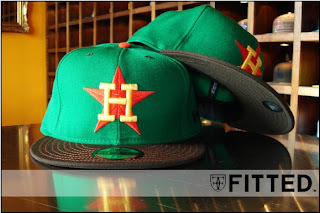 The “H” on this version is black with a neon green stroke, also seen on the FITTED crown and crest, and featuring the same Hawaiian State seal printed on the satin lining inside. 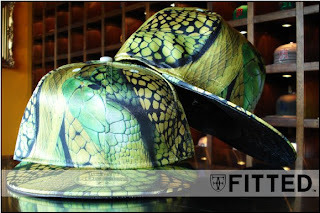 These are limited, and are also available at the following boutiques. Also is you plan on coming early please park your car off site. Blueprints are basically the starting point for any project, it’s where all the combined ideas come together and are layed out before the final product is actually put together. The many meetings at Helena’s is where the blueprint was laid out for Fitted, and was born – which transpired into what you see today. And that leads us to “The Blueprint, 3 years and counting” tee on all white with Fitted across in 3-D and all the small, fine details that go into a blueprint. 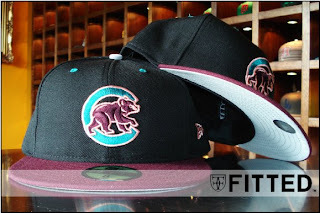 With the hat, we flipped a Milwaukee Brewers: dark green on the 2 front panels, black on the back four and brim, red underbill and dark green eyelets. Lastly, we have a Red with black pinstriped UH hat with a denim Bill. All releasing Tomorrow 11.18.08. Aloha & Mahalo’s for all the support through the years! 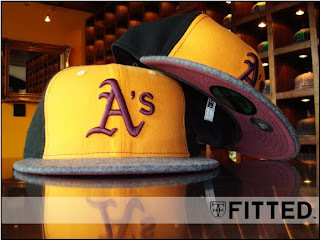 Tonal Orange UH, Black/Maroon Cubs, Green/brown Astro’s, & Black/yellow/melton grey wool A’s. Aloha & ladies & gents. As always, we bring you another quality release. We hope you guys are satisfied with the quality amount of product we have been unleashing on y’all, we definitely pride ourselves in all our designs, whether it be t-shirts or caps. Let’s get down to business, starting with a custom MLB: Toronto Blue Jays featuring blue on the back four panels and gray on the front 2, green brim and red button with an alternate Toronto logo. With this new shirt we wanted to pay tribute to everyone in Hawaii who is going through the current struggle that is bound on all of us, from being in this recession, to our local troops stationed abroad, the employees who recently lost their jobs at Aloha Airlines. The shirt comes in dark gray and features a seal with the idiom “Blood, Sweat & Tears” (also translated in Hawaiian), with 2 kahilis on each side.